All homes are currently sold. Occasionally resales do become available. Welcome to Vintage Green, the new living experience for mature adults. Vintage Green is a development of seventy-one semi detached and single homes ranging from 1,025 to almost 1,800 sq. ft. Each home is totally wheelchair accessible. The hallways and doors are extra wide and every unit has a walk-in shower. The laundry rooms are always on the main floor. All residences have a full basement where an extra washroom is already roughed in. There are two bedrooms in every home and all but the smallest have two full baths. Optional florida or sunrooms with skylights will let you enjoy the outdoors without ever having to face the elements. All the homes are totally bricked with aluminum soffit and fascia and interlocking brick driveways. The lawns are mowed and fertilized and the snow is cleaned right to the front doors. If you are away for an extended period we will, if you so desire, check your residence to comply with insurance purposes. Community is important in Vintage Green. The Club House is there for everyone's use, whether you want to play cards or pool, do crafts or have a dance. Vintage Green is self contained, not isolated. 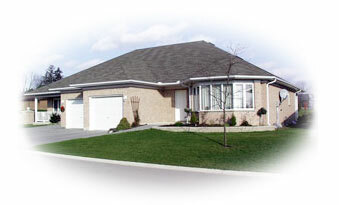 We are situated in the heart of Ilderton, a village of about 900. London, with its shopping malls, theatres and renowned hospitals is only ten minutes away. At Vintage Green you are with equals; successful, mature people who have known hard work and are prepared to enjoy the rewards of that work. If interested, please contact us. We can give you additional information. We will also be proud to show you in person all we have to offer! Copyright © 1999 - 2001 Vintage Green Inc.